The PM who cried wolf. There IS genuine growth, but not as much as the neverendingly-massaged statistics suggest. And now the price for twisted data has to be paid, as the UK receives an inflated bill to pay to the European Union. Now David Cameron, characteristically, throws his toys out of the pram and complains that the EU didn’t even tell him about the sum for two days. Strangely, he has no apparent grumbles about the Chancellor of the Exchequer, George Gideon Oliver Osborne, not telling him about it either, even though he received the news up front. David Cameron can thump the table, stamp his feet and shout all he likes …. he’s been caught out in a lie and now the pigeons have come home to roost! When you have an (unelected) prime minister and a chancellor of the exchequer (who doesn’t even know his seven times table), who have manipulated and lied about the economy, they shouldn’t be surprised when they are forced to live up to their fiction. The EU have asked the UK to pay £1.7 billion pounds because… the UK economy has improved. If the economy HAD improved to the extent that CaMORON says it has, then this payment would not be too much of a problem. There has indeed been an improvement in the economy, but only because of factors such as the money from activities such as drug use and prostitution being used to bolster the figures. The British Coalition Government has attacked so much it seems incredible that they still had any new targets left by the start of this year. They’ve attacked the unemployed, they’ve attacked the disabled, they’ve attacked women, they’ve attacked asylum seekers, they’ve attacked the European Union – all the predictable scapegoats for any administration led by the Conservative Party. But throughout this year, a new phantom ‘enemy of decent society’ has been assailed by waves of Tory hatred. That helpless enemy goes by the name of ‘reality’. Reality is now under Government attack. The two chief perpetrators of this brutal assault on the dimensional planes of the physical Universe are Iain ‘IDS’ Duncan-Smith, the Secretary of State for Work & Pensions, and George Gideon Osborne, the Chancellor Of The Exchequer and Second Lord Of The Treasury. IDS has been hunting with a particular zeal any and all traces of reality that might be seeping in at the edges of his vision. His most powerful strike against the blight of factual accuracy was probably in March earlier this year, when he appeared on the BBC’s Sunday Politics programme, and was presented with a graph from the Institute of Fiscal Studies, which demonstrated conclusively that child poverty in the UK has surged upwards during the current Government’s time in office, and indeed is projected to continue climbing well into the future if current policies are maintained. IDS’ response was simply, “No, no, the point is that child poverty has fallen.” He then proudly, defiantly, steadfastly, and in considerable impressive detail, failed in any way to present the slightest shred of evidence in support of this. Argument won! That showed you who’s boss, reality! This week, spokespeople at the Treasury, acting on behalf of our country’s beloved Chancellor and unrivalled master of economics – the aforementioned Gideon – announced that the UK’s monthly National Deficit for September 2014 was £1.6 billion higher than it was in September 2013 – £11.8 billion compared to £10.2 billion a year earlier. Once again, those insidious, cynical fact-things are trying to push their arrogant way into the public arena, see? Confound them! But fear not, everybody, Gideon was ready and waiting for them. He heroically armed his spokespeople with a trusty statement that declared that, with this increase in the Deficit, the Deficit-reduction plan is working. Huzzah! Facts dismissed and sent scurrying into hiding once more! Come an’ ‘ave a go if ya think yer ‘ard enuff, reality! With Prime Minister David Cameron’s repeated declarations that, “We are paying down the National Debt”, when the National Debt is now approximately £400 billion higher than it was when he came to power – and has risen steadily and without a pause all the way through the life of this Parliament – we can see that the people near the top of Government are consistent and unified in their shared contempt for anything outside the abstract world inside what passes for their minds. Sadly for them, the rest of us do live in the real world, and that means we are in no position to take any comfort from the abstractions that dominate their vision at all. Therefore, most of the time, whether a Deficit increase is good news or bad news depends on whether it is caused by increased investment (good) or a decline in tax revenues (bad). In this case, it looks quite firmly to be the latter, and therefore bad news, but either way, a Deficit rise for any reason is the polar opposite of what George Osborne had in mind when he set out on his Austerity plans four-and-a-half years ago. He went in, from the word ‘go’, with the very simplistic – economically illiterate even – notion that every time he cut spending, the amount of public money to spare would automatically go up. He never considered – perhaps was never aware of – the wealth-generating feedbacks that come from well-judged public investment. Therefore, wiping out the Deficit was, and is, an end in itself for the Coalition Government. Now it was clear within just a few months of Osborne becoming Chancellor that he was never going to manage that, both from the reckless ‘hatchet-all-spending’ approach he was taking, and from the early non-results he was getting. He has reduced the Deficit by about a third, but with no more than eight months to go until the next General Election, he is clearly going to miss his target of wiping out the Deficit completely by well over sixty per cent – the rough equivalent of firing a ballistic missile from somewhere near Atlanta in the direction of Moscow, only for it to land in the outskirts of Reykjavik. And the latest figures suggest that even a miss of over sixty per cent may be optimistic, because now the Deficit is climbing again. This is probably because the ‘cheating‘ the Government has done to lower unemployment figures means that many new workers are not earning enough to pay much Income Tax, and further do not have much money to spare once they have purchased their day-to-day essentials, so cannot buy enough consumer goods to make a significant contribution to Value-Added Tax receipts either. But whatever the exact reason, the Deficit for the last year is up, not down, and for Osborne’s people to announce that while also claiming that the Deficit-reduction plan is ‘working’ is akin to declaring that up is down, that dry is wet, and that silence is loud. Now Osborne and his sycophants at the Treasury have joined in. Tories practising the Orwellian art of Blackwhite. Orwell was a lot brighter than the present George O. 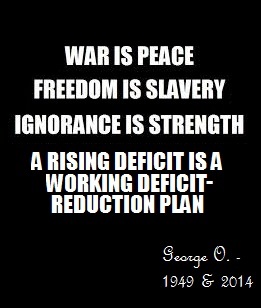 Could that be why Osborne keeps trying to ape some of Orwell’s scarier ideas? For that reason alone, the Tories absolutely must be voted out in the spring. When people believe the figments of their imaginations more than they accept what is happening around them – even when it is proven to them – then these people are capable of doing almost anything… except anything that should be done. What Freud said wasn’t quite as bad as some people have made out, but it still amounts to saying that employers should only pay the minimum wage when they really feel like it. At the risk of incurring the wrath of my fellow lefties, I’m going to defend Lord Freud’s remarks while still disagreeing with the argument I think he was trying to make. I say think because what he actually said was pretty clumsy, and could easily be interpreted as offensive when viewed a certain way. So what do I think he was saying then? ‘Relativism’, much of the time, is an ironic name, because relativist arguments are often employed in ways that are irrelevant. It appears that since before clear records began, political figures have used relativism arguments to justify their own conduct. Well, to be honest, we probably all do it to some degree, and we were probably very prone to it when we were in school – getting told off by a teacher for hitting a classmate, say, and trying to change the subject by saying, “Not fair, Johnny Bashforth hit me the other week and you never told him off!” Yes, it probably is unfair, but at the same time that has nothing to do with you deciding to hit someone else altogether. A lot of this really should be left behind in the playground, as all that should really matter is knowing when we have done the wrong thing, instead of making an issue about others being as bad as we are. There are many parts of ‘grown-up’ society where the same behaviour continues to manifest itself though, and nowhere more so than in politics. Many a politician will respond to being confronted about an action or quotation attributed to them that is embarrassing, or foolish, or downright corrupt with a pointed finger directed towards a member of a rival party, citing a vaguely similar quotation or action of doubtful relevance. Not just action, but cross-examination of policy will often be treated to the same ‘aggressive evasion’. Diversions used by any party will frequently begin, “Oh yes, well look at [such-and-such-a-party], did you hear what they said the other day?” Or, if it is the incumbent Government, “Oh yes, well look at the previous administration, see what a mess they made of the economy/health service/education/industrial sector” (delete as appropriate). It is a more or less day-to-day occurrence. So let us now congratulate the UK Independence Party on its most remarkable achievement to date. No, I am not referring to their victory in the Clacton-On-Sea By-Election (which may have been UKIP’s first ever seat in Parliament, but in the final analysis it was just a case of an incumbent retaining his seat). Instead, more remarkable by far, is that over the last year or so, UKIP has managed to increase the rate at which diversionary finger-pointing is employed in political discourse. I doubt it was intended, but that is some accomplishment, given that the phenomenon already appeared to have maxed-out. Since UKIP’s recent emergence as a ‘significant’ presence at Westminster (if we are to assume that a party with a single Member of Parliament, and which has never had control of a single council anywhere in the country in its entire history, can be called ‘significant’), countering an accusation with grumbles about how badly other parties behave has proven to be, not just a standard tactic, but pretty much the only tactic that the party can employ with any consistency. I mentioned a few days ago the live interview of Nigel Farage by James O’Brien on LBC Radio back in May. One observation that O’Brien rightly made during that crossing-of-swords was that Farage, when faced with the extremists and foolish throwbacks who are prevalent in his party, will usually insist that there are people like that in every party. Firstly, Farage cannot pretend one minute that UKIP is an ‘alternative’ to the mainstream parties, and then say the next that his party simply has the same types of idiots in it that all the others do. Either the party is different from the others or it is not, it cannot be both. Secondly, Farage has to acknowledge that the rate of silly/incendiary extremist behaviour coming out of UKIP is a lot higher than from other parties. The total number may not be higher – of that I am not sure – but Farage has to consider scale. UKIP’s membership is tiny compared to those of the Tories or Labour, and yet the number of silly incidents coming out of UKIP is at least in the same ballpark as those of bigger parties. The rate of ridiculous ideas and ugly behaviour in UKIP e.g. ‘homosexuality causing floods‘, ‘gay marriage is grotesque and shouldn’t be allowed, but UKIP members breaking the law by apparently hiring prostitutes is a private matter‘, starving hundreds of helpless animals to death etc is startlingly high. Thirdly, Farage needs to face the reality that there is a flip-side to over-exposure, and his visit to LBC Radio was his worst encounter with that. 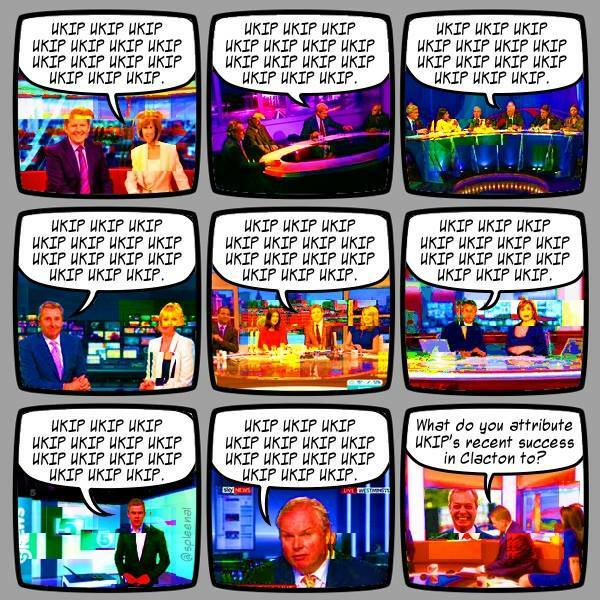 Now, UKIP has benefited from wildly excessive, utterly disproportional, and overly-sympathetic and uncritical coverage in the national media over the last six or so years, most particularly on the BBC. (As is often pointed out by exasperated British commentators across the internet, Nigel Farage almost has his own permanent seat on BBC Question Time.) The party has had a tiny support base right up until the early months of the current Parliament, and for much of its twenty-one years, it has been easily dwarfed by the likes of the Green Party and the Scottish National Party. However, the Greens and the SNP each get a tiny fraction of the coverage that UKIP has received, and when they do get coverage in the mainstream media, it is far more likely to be cross-examined and heavily-challenged than anything UKIP says or does. The media are self-unaware but make sure everyone is UKIP-aware. But most of all, leading back to the point we opened with, Farage never really explains, when saying “You think we’re bad? Look at that lot…” why it is particularly relevant. Sure, there are Labour politicians I would never want to vote for, there are Lib-Dem politicians I would never want to vote for (at least after last time – there, I admit it, I voted for the wrong party in 2010), and of course I can hardly think of a Tory politician since the start of the Twentieth Century that I would want to vote for. But here is the thing Farage does not seem to get; most of us already knew that. His finger-pointing is not nearly as enlightening as he seems to imagine it is, because we already knew that there are politicians of all shades that we would rather keep a distance from if possible. What we do not know is why that means we should vote for UKIP instead of them. Especially in light of Farage’s protestations that having idiots in the ranks makes UKIP no different from the other parties. That is just an admission that his party really is no different at all. Farage raged repeatedly at O’Brien that he wants a debate on immigration, and instead “everyone wants to talk about the idiots in UKIP.” But the first thing he needs to do if he wants solely to have an immigration debate is to establish precisely why those idiots are a less important topic. As highlighted above, the proportion of fools in UKIP is disturbingly high, which means that for the party to get a substantial presence in the House Of Commons would mean at least some of these fools getting in and having a direct role in the Government of the country. The electorate is entitled to know about that, they are entitled to be aware of who the fools are, and what they stand for – especially when the party keeps claiming that these members are ‘different’ and an ‘alternative’ to the mainstream. Farage is not doing a very good job of proving that. The reverse, you might argue, is also true; when other parties have members who have silly or extremist views, the electorate is equally entitled to know. Well yes, of course. But that is not really a matter for Farage to bring up at the precise time he is being confronted with the realities of his own party. As UKIP’s supposed ‘leader’, the improper behaviour within his own ranks is his responsibility to address when it is brought to his notice. That is not the moment to start bleating about a Tory candidate supposedly being an ex-member of the British National Party. It appears to be true, but that is the responsibility of David Cameron. The sad fact is though that Farage’s slightly childish example seems to rub off on UKIP’s supporters. Or perhaps it is what draws them to him in the first place. One way or the other, we see the same behaviour repeatedly from UKIP voters, especially when they insist on getting their ha’penny’s-worth in on left-wing blogs. Now, most of the stuff Guy asserts about Douglas Carswell’s defection is assumption-based but might be sustainable. However, in the highlighted text, he starts bemoaning the menace of the Tories. Now his criticisms of them are fairly accurate – their plans are indeed a threat to free speech and much else besides – but once again, he comes across as a UKIP supporter trying to change the subject. The screencap was not about Tory policy, it was about a former Tory who defected to UKIP. Just nipping off-topic for a moment, Guy is ignorant if he imagines that Mr Sivier does not criticise the Tories regularly on his blog. In reality, I would estimate over half of the posts he publishes cross-examine and criticise Conservative policy in considerable damning detail – he does comfortably more than his share of “shouting at” the Tories. Guy is also ignorant if he imagines that one fool in UKIP’s ‘fan base’ (strange term to use, but in fact, probably accurate – they are like sports fans, not political supporters) is all we have found. We see these same behaviours all the time in disturbing numbers of UKIP’s supporters, as does Thomas G. Clark on the Another Angry Voice Facebook page. Your correspondent doesn’t mention that website where the confirmed sexual preferences of Labour party members is displayed for all too [sic] see. Their preferences are not nice. We can all pick holes in other party’s [sic] members or voters – it’s a game that truly does no one any good. Does it? Can you confirm that the Clacton voter to whom you refer was not, previously, a committed socialist (disillusioned like so many) or a past, regular Labour voter? I have read and re-read this swipe (?) nearly a dozen times now, and I am still struggling to work out what Guy thought he would achieve by saying it. It has absolutely nothing to do with the subject under discussion at all. Once again, it seems to be just a desperate finger-point of precisely the type that Farage uses every time he is interviewed by anyone asking him about the ‘idiots in UKIP’ – anything to change the subject. What exactly have the sexual tastes of Labour Party members got to do with the stupidity of a UKIP supporter who votes for a candidate he/she expressly wants to see the back of? I am certainly not saying that it is unimportant if Labour members are, for instance, active child-abusers, but once again, the subject has been raised out-of-nowhere, presumably in the hope it will provide something that UKIP supporters feel less awkward talking about. It is also, again going slightly off-topic here, wildly speculative to suggest that the voter in question was once a socialist/Labour supporter. There is nothing whatever to indicate any such thing, it is just the wildest, emptiest guess, which once more hints at Guy being a bit desperate for something to divert the discussion elsewhere. But even if the voter were once a Labour voter, so what? He or she has still become a UKIP supporter for a really unintelligent reason, and that was what was under discussion – the fact that people who turn to UKIP often display, to put it politely, less-than-impressive intelligence. This pattern, this mixture of paranoia, humourlessness, evasiveness, desperate finger-pointing, and, yes we shall use the word, stupidity, is very, very commonplace among UKIP supporters. Objecting to it being pointed out on the basis of it ‘alienating’ UKIP supporters is nonsense – they have presumably already been alienated in the first place – but when they are saying and doing foolish things, it needs to be pointed out to them. And given how rudely and aggressively many UKIP supporters tend to take issue with people who say things they disagree with, they can hardly complain when the people they have insulted take the opportunity to mock them back. What I would suggest that the people who wish to defend UKIP supporters from accusations of stupidity and mindless paranoia try is something that UKIP supporters themselves never seem to bother with; they could try offering up some evidence. By that, I mean, do not just demand that there be no accusations of stupidity, actually offer up some evidence that there really is some creditable intelligence among the UKIP support base. Demonstrate to us genuine examples that there are plenty of people in, or voting for, UKIP who are a lot more intelligent than the very loud ‘minority’ who keep setting themselves up to look stupid in front of the whole country – remember ‘Jack’? There is always copious evidence of UKIP supporters behaving like whining fools, just have another look at Thomas Clark’s page, linked to above. There is seldom any real evidence that I can see circulating of them behaving intelligently, shrewdly, or with consistency. If that is because an ‘intelligent majority’ in the party are too quiet, then maybe it is time they spoke up a bit more than people like ‘Jack’ or ‘Guy’? And here’s another example. A pro-UKIP group was recently set up on Facebook called “Exposing anti-UKIP groups for the liars and nutters they truly are” (although in practise, the group seems caught up in an exclusive ‘war-of-the-sexes’ with Women Against UKIP rather than on a mission against wider opposition). The administrator running the group uses the same strategy – or at least thinks he does – of saying, “Someone else is just as bad” in response to an accusation, rather than attempting to refute it. He then goes on to display a total unawareness of UKIP’s outlook, or whose support it includes. UKIP’s online spokespersons appear to know nothing about… UKIP. Or anything much else. We have yet another online ‘activist’ trying to mobilise voices in defence of the UK Independence Party without appearing even to know who its allies are. It is only through consistent ignorance of what UKIP is really about that anyone will support them at all. 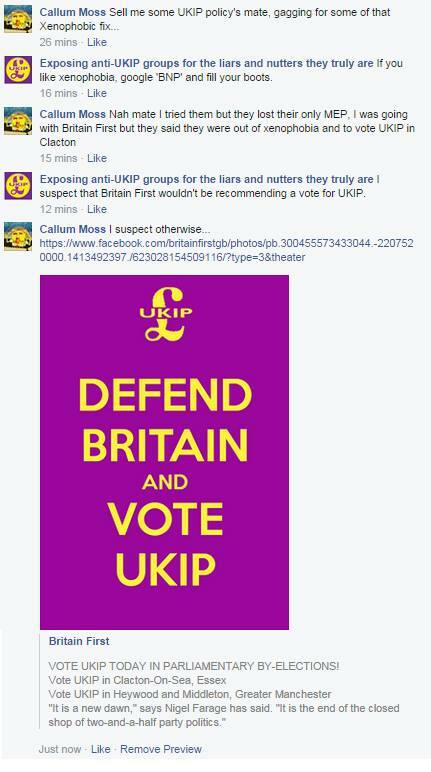 Thanks to Callum Moss of the UKIP Exposed: A Wolf In Sheep’s Clothing page on Facebook, for this screencap. Osborne & His Austerity Program Have Been A Total Failure, Not A Partial One. The United Kingdom has had a little over a year of economic growth. The Conservative Party has spent that spell in the throes of loud and nauseating self-congratulation, the loudest and ‘nauseating-est’ being reserved for the Chancellor Of The Exchequer, George Osborne. As I detailed previously, Osborne’s program for repairing the economy after the banking crisis of 2008 has been composed of self-defeating policies collectively titled ‘Austerity’. Realistically, this label is just an early-Twentieth-Century title for old-style Conservative Party abandonment of the poor and needy. The term is used to make it sound like a wise and sound approach to managing the economy, rather than what it really is – pandering to the greed of people who already have more than they are ever likely to need in their entire lifetimes. Now let us be very clear about this, Osborne’s Austerity policies have been an abject failure in terms of repairing the economy. None of them have done any detectable good at all for anyone, except those aforementioned people who are already very well-off and, on a personal level, were little-affected by the ‘Credit Crunch’ anyway. But inevitably this assertion will lead many to ask why, if the policy platform has been such a hash, have we had a year or so of growth, with unemployment coming down? Well, quite simply, the growth has happened in spite of Osborne’s tomfoolery, not because of it, and the unemployment figures have only come down by what has become a vile standard tactic among successive Governments going back some thirty-five years – figure-fiddling. The recent spurt of growth in Gross Domestic Product (GDP), which by the way should never be taken as an overall measure of how well an economy is doing, only as a measure of the amount of activity there is, has partly happened automatically, partly happened as a result of a policy Osborne enacted that runs completely contrary to Austerity – without being much-commented-on in those terms – and partly happened as a result of a phenomenon that Conservatives usually express distaste for. Firstly, let us view the automatic aspect. Quite simply, any market economy in recession will expand again eventually. The point when this becomes inevitable is, as it were, the point when everything has hit ‘rock-bottom’. This is usually when the vacant resources of industry have been inactive for so long, and demand for them has therefore declined so precipitously, that the price for accessing and making use of them has plummeted too. At economic ‘rock-bottom’, the prices for enough of these resources become so low that even the most greedy and cowardly investors will feel it is worth putting that bit of money in to get things moving again, as almost any feedback to come from the investment will be profitable. Hitting ‘rock-bottom’, let me stress, is not a necessary part of the process of recovery, it is merely the point, if it is reached, where a re-expansion will happen anyway, irrespective of how much else is going wrong. The problem with Osborne’s Austerity approach is that it took so much stimulus out of the British economy that hitting ‘rock-bottom’ was the only way a re-expansion would begin. His policies in fact needlessly delayed a recovery in GDP by some three years, by slashing services to the poorest, inflicting widescale, unnecessary misery, while handicapping the whole system. Without wage-supplements from the Government for low-paid workers, or income for many of those out-of-work, capital movement around the economy was persistently slowed down from mid-2010 until late in 2013. Given that modern Britain is, for better or worse, a consumer economy where sales by businesses to the public are the lubricant that keeps the wheels turning, depriving literally millions of potential consumers/customers of access to money was always going to do harm to far more people than just the – largely-mythical – ‘scrounger-class’ that Tories have spent centuries blaming for the ills of society. Secondly, let us look at the policy that Osborne enacted that, while still very wrong in the long term, at least helped trigger some stimulus in the economy in 2013, even though it ran completely contrary to the ideology of Austerity. In the spring-summer of 2013, he announced the start of what, at first, sounds like quite a generous program of funds to give to the general public. It is called the ‘Help-To-Buy’ scheme, and involves giving people, who are in the market to purchase a house, a proportion of the funding with which to do so. Now, the proportion in question – no more than 20% and usually far lower – is in fact not that generous at all, given how ridiculously inflated house prices have been allowed to become since the Margaret Thatcher Government of the 1980’s gave the Financial Services Sector dangerous amounts of unchecked power – it created the toxic lending culture that eventually caused the crash of 2008, with the Financial Sector using house-prices as the collateral for many of the really big loans sold to the public. Encouraging poor people to invest in a house while prices remain so ludicrously high is irresponsible, as they will still be forced to take out a very large mortgage that they will probably never be able to pay off fully. It is likely to cause a repeat crash, and given that real-terms wages for the majority have been frozen, or have even declined, over the last couple of years, that crash could conceivably happen very soon. But whatever the reality of that, and whatever merits or evils one might see in the policy, there is a more pertinent point in the context of this essay; Help-To-Buy is, quite simply, the antithesis of Austerity. The fundamental principle of Austerity is supposed to be that, insofar as it is possible to do so, the Government has to stop spending money, in the rather naive belief that this will make the economy work more efficiently and make it possible to pay off the nation’s debts (even though those debts are, in a manner-of-speaking, paid off ‘automatically’ by the Central Bank when they fall due, through a process of Quantitative Easing, irrespective of what general economic activity is happening). Regardless of whether it is right or wrong to make the attempt, any Government implementing Austerity must cut any service or investment that it thinks is unnecessary, while also avoiding starting up any new spending programs as well. Whether we regard Austerity as a good idea or a bad idea, the simple reality is that Help-To-Buy is the complete opposite of that. It is a new spending program introduced by George Osborne at the Treasury. It should be seen as a tacit admission by the Government, in fact, that its Austerity ideas have failed disastrously. The reason the scheme helped the economy to start growing is that, when the scheme was formally announced, it immediately caused fresh interest in the housing market. With the potential for some new customers trying to get onto the property ladder, house prices began to go up again, and with property values climbing, this in turn made the idea of using a house as collateral against a loan look more attractive to the financial services sector once more, and so lending started to increase again. (It is also worth noting that an increase in house-prices means that, even with the Help-To-Buy support, house-buyers are unlikely to be any better off than they would have been before, as the extra money the Government gives them is offset by the increase in the total they have to pay to the seller.) Therefore, in the short term at least, more people had (borrowed) money in their pockets and could start spending a bit more freely, and so the retail sector managed to get some sales back, hence there was at least some fresh growth at last. This appears to have been the main ‘trigger’ moment for the current growth in the nation’s GDP. But that growth is largely based around borrowed money and rising house prices, just as the growth before the crash had been. And see where that led to – a collective banking ‘choke’, when too many borrowers at once found they just did not have enough income to pay back their loans. This remains a severe danger, as there has been very little growth in non-service sectors. Manufacturing, energy, and Primary (resource-procurement such as wood and coal) sectors remain sluggish and are not doing recognisably better than they did when the Coalition Government was elected, and that means they are unlikely to start employing more people soon, and so borrowers are unlikely to get the improved income they need in order to keep making their repayments. So the services sector cannot keep such a ‘recovery’ going indefinitely, not when it is fuelled by debt. Without the rest of the economy waking up, growth can only last until these private debts need to be paid back in full. When many people are taking out loans because their frozen wage-packets are not enough to live on in the first place, we can be sure that they will not be able to pay the money back in its entirety, or anything like it. So when enough of them suddenly default, we can be confident that the banks will be back exactly where they were in 2008. And so will the rest of us. Only when Primary and Secondary industries are back to some kind of health will we be able to talk about a genuine ‘recovery’. This is what economists talk about when they refer to the current ‘recovery’ as being ‘unbalanced’. It has been the slowest ‘recovery’ in modern British history, and also the most one-dimensional. Re-balancing it so that other sectors can get into gear and take up some of the strain before there is another banking ‘choke’ is likely to require some direct Governmental investment, perhaps even direct Governmental control to force things to start moving, sooner or later. But it seems unlikely that the Conservatives could ever stomach doing that, as it runs contrary to their dogma against Government’ ‘interference’ in the market. In fact, for much of the first couple of years of the Coalition, without the net influx of people from abroad, the economy would almost certainly have slid back into recession, instead of merely flat-lining as it did for so long. Now that Help-To-Buy has given more of the native population some borrowed income, the immigrant factor has helped to make GDP grow. Please remember this next time you hear that odious lounge-lizard, Nigel Farage, leader of UKIP, grumbling about Britain being ‘full’ and how it is ‘time to pull up the drawbridge’. If it had happened when he first made such demands, Britain might have gone into a full-on economic depression. This is not to say that indefinite immigration would be a good thing, but for several years, it was probably the only thing that kept the British economy from freezing up completely. So, those are the three factors that have driven what just about passes for the ‘economic recovery’ of the last year – the rather measly achievement of establishing a bit of growth. That growth has happened in spite of Austerity, which has not played a role in of any of the three factors, regardless of the sudden chorus of unswerving praise that Osborne is receiving for stubbornly clinging to it. The reduction in unemployment has largely been achieved by simply redefining ‘unemployment’ as “people claiming Jobseeker’s Allowance” rather than “people not in work” while also making JSA and other benefits cynically difficult to obtain, and by forcing people into low-paid, insecure, non-productive temporary work while pretending it is full-time work. This is another example of an unbalanced recovery, as such insecure jobs can easily tip over into widescale job-loss within days, while the poor wages again contribute to the latest private debt ‘time-bomb’, of which Osborne has started the countdown. If we want to measure Osborne’s success or otherwise, we should keep in mind two of the goals he himself set when he first became Chancellor Of The Exchequer. He even said, quite explicitly, that his success or failure should be measured against one of them. The first of these was to have the National Deficit wiped out by the end of this term of Parliament. It is highly debatable whether wiping out the National Deficit and running a surplus is ever a good idea – I strongly recommend studying Alex Little’s outstanding blog for a better understanding of why a Deficit is not a particularly bad thing at all (it is simply the name we give to any private sector slack that is taken up by the Government) – but either way, that was the goal Osborne (and Cameron) set, and not only is he poised to have failed by May next year, he is set to miss his target by many scales. The recent proud mantra from Tory spokesmen has been that Osborne has cut the deficit by a third, when, if he had been successful, it would be all-but-gone by now. Osborne’s boasts about cutting the deficit by a third are the equivalent of trying to walk from Land’s End to John O’Groats, giving up somewhere between Bristol and Birmingham, and proclaiming the venture to be a great success because you got pretty close to Kidderminster. By his own stated objectives, never mind the standards demanded by genuine experts, Osborne has failed completely. He has been such a disaster as a Chancellor that, merely by having a spell of unstable growth while on his watch, it has come as such a relief that large numbers of commentators actually view that as a fine achievement in itself. But it is no such thing. There was a spell of renewed growth during the last few months of Alistair Darling’s spell as Chancellor at the end of the last Labour Government, when several investment programs he had set up started to generate fresh activity in the aftermath of the banking crisis. The growth stopped almost as soon as Osborne started his cutting exercises at Number 11. It is actually not difficult at all for any Chancellor Of The Exchequer to generate a crude spell of growth in one form or another in almost any circumstances, and, far from being a tremendous achievement, it is surely the absolute bare minimum to be expected of any Chancellor, without which he simply should not have been put there in the first place. Any less and he is merely an angler who never catches even a single fish. And the terrible thing is, Osborne was sat on the riverbank for three years, the un-baited hook of Austerity bobbing on the surface of the water, without plucking anything from the depths except old boots. In 2013, he finally realised he needed to invest in bait, and even though it was a cheap and unappealing bait that he used, it was just enough to lure a few minnows to gnaw on the line. His Conservative colleagues are now telling us what a lavish banquet these minnows make. Not starving to death, it seems, has become a luxury in Britain. At least when you are poor. Laughing At Jack Is Fair. James O’Brien of ‘Leading Britain’s Conversation’ (LBC) Radio is becoming quite the needle in the flesh of the UK Independence Party. A few months ago, many will recall, he gave the party’s loathsome leader, Nigel Farage, an absolutely bruising grilling live on air, and triggered several rather telling xenophobic ‘slips’ from Farage. This week, he presented a phone-in in which he spoke to a UKIP supporter going by the name of ‘Jack’, and exposed rather easily just how little that ‘Jack’ knew about the party he supports with such unquestioning passion. O’Brien repeatedly asked ‘Jack’, throughout the conversation of nearly four-and-a-half minutes, to explain what UKIP is for as a party, and what its policies are. At no stage did ‘Jack’ give any kind of coherent or reasoned answer, at best resorting to extremely ill-defined labels such as ‘common sense’ (in my experience, when supporters of the right-wing use that term, they usually mean, “Anything that agrees with what I’ve already decided”), or at worst, easily-exposed bluffs such as, “There are too many policies to list”. It got rather laughable as ‘Jack’ repeatedly lapsed into confused and awkward silences as he strained to think of answers to what really should have been very simple, basic questions for anybody putting themselves forward as a spokesperson on behalf of an organisation. There is an echo of truth in that. I very much doubt that there are too many die-hard Labour supporters, for instance, who realise just how little their party is removed from the Conservative Party these days – it certainly remains to the left of the Tories, but is no longer left-of-centre. Re-nationalisation, for instance, once a stalwart policy of the Labour tradition, has been completely abandoned ever since Tony Blair took over from the late John Smith in 1994, but how many Labour supporters realise the implications of that? But even so, I don’t feel in any way sorry for ‘Jack’ that he has been given a bit of a public kicking over social media since, because he really brought the ridicule on himself. If someone had walked up to him in the street, stuck a microphone in his face and asked him what party he supported and what their policies are, then I would have felt sorry for him if he stammered and made a hash of answering. In those circumstances, he would have been ‘ambushed’, so to speak, the questioning would have been entirely unsolicited, and he would have had no chance to prepare himself. However, this is not the way it went. ‘Jack’ himself telephoned LBC Radio by his own choice. He did so entirely on his own initiative, and with the quite explicit aim – he said it himself – of ‘correcting’ O’Brien on whether UKIP is opposed to immigration. He was therefore putting himself forward as a spokesman for the party, in effect. Apart from having a functioning voicebox, the most important requirement for a spokesperson is to be properly informed about what is to be discussed. And ‘Jack’ fouled it up. He was simply unaware of the very clear evidence of UKIP’s own rhetoric that it opposes immigration, and was also quite unaware of policies outside of that sphere, when he was asked what they were, and what the party stood for. ‘Jack’ showed no particular recognition even of UKIP’s core, founding policy, which has nothing much to do with immigration – British withdrawal from the European Union. Instead, ‘Jack’ tried to deflect such questions with a declaration of just “I don’t care” about anything except (his perception of) immigration being out-of-control. This is a quite explicit admission on his part that he is an active supporter, and self-appointed advocate, of a party whose policies he is unwilling to make the effort to learn about beyond one narrow area that he is fixated on. To say that while trying to act as a spokesman for the party was comically obtuse. I fear that ‘Jack’ fits a wider pattern of UKIP-supporter behaviour. He is whiny and paranoid whenever confronted, not with propaganda, but with simple evidential facts about the party’s uglier characteristics, among both its membership and its policies. ‘Jack’ is very loud, and goes out of his way to make sure that everyone hears him, so when he says something stupid, everybody knows about it. He speaks up with impassioned certainty and love in defence of UKIP, while not really knowing anything much about the people running it, or what they aim to do. He almost seems to have a teenage ‘crush’ on UKIP. I am quite confident that if all of UKIP’s current support-base really did know what the party is about, and what it really stands for i.e. the powers and wealth of rich, privileged people, the demonisation of minorities and alternative lifestyles, victimisation of the poor, the ill, and the disabled, hostility to ‘the other’, idealisation of a very narrow definition of what constitutes a respectable member-of-society, and the re-establishment of a Victorian-style hierarchical social structure across all of the United Kingdom, they would almost all drift away within days. This is because ‘UKIP-ism’, for want of a better name, is simply a more extreme and even more narrow-minded form of Toryism than we get from the Conservative Party itself. It is quite terrifying enough that such an extreme is even possible, let alone that there is now a party that embodies it. UKIP is even funded almost entirely by a rich core of ex-Tories, who have long favoured continuing and cementing the status quo in British politics and society. It is only because so many people do not really understand how thoroughly right-wing, how extreme, and how anachronistic its outlook is, that UKIP has been able to get such an enlarged groundswell of support over the last five years. Enormous, disproportionate, uncritical over-exposure in the media, especially by the BBC, has given the party the oxygen of publicity, while failing to provide the toxicity of exposing its real nature or aims. For making such a fool of himself by his own choice, ‘Jack’ deserves to be laughed at. For largely being very similar to him, much of the rest of UKIP’s support should not be laughed at, but regarded with despair. They are an embarrassing and dangerous reflection of how superficial and uninformed political debate has become in this country. Ed Balls will make a poor Chancellor Of The Exchequer so long as he endorses everything that George Osborne has done wrong. But that’s what he keeps doing. “We know there would have been tough decisions on tax, spending and pay restraint in this parliament whoever was in government. But three years of lost growth at the start of this parliament means we will have to deal with a deficit of £75 billion – not the balanced budget George Osborne promised by 2015. And that will make the task of governing hugely difficult. And this goes to the heart of the political challenge we face. People know we are the party of jobs, living standards and fairness for working people.